The Kentucky Exposition Center, the sixth largest facility of its kind in the United States, covers more than 1.2 million square feet of indoor exhibition space, meeting rooms and public areas including Freedom Hall, a 19,000-seat indoor arena. Located just minutes from downtown near I-65, I-264 and the Louisville International Airport, the Kentucky Exposition Center is the permanent home of large-scale events like the Kentucky State Fair, the National Farm Machinery Show, and the North American International Livestock Exposition. The Kentucky International Convention Center, located in the heart of downtown within walking distance of iconic attractions and distilleries, is open for business after a two-year, $207M expansion and renovation resulting in more than 200,225 contiguous square feet of exhibit space, a 40,000 SF column-free ballroom with color-changing LED lighting, a 175 seat theater and 52 modern meeting rooms. The amazing natural light in pre-function spaces opens the center to Louisville’s thriving downtown and features Kentucky-inspired design, artwork and culinary offerings like Oak & Brew – a coffee-by-day, bourbon-by-night experience. KFC Yum! Center, a multi-purpose arena located downtown, has a wide variety of spaces available to suit the needs of any large corporate gathering or event in addition to sporting events and concerts. 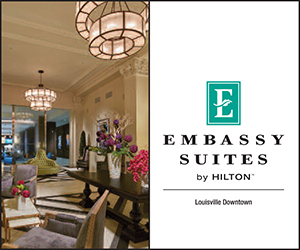 Other venues include the legendary Churchill Downs, the Frazier History Museum, the one-of-a-kind Muhammad Ali Center, the Kentucky Derby Museum, Louisville Slugger Field, and many more.